English version - Thomas Anders Online - Die offizielle Fanpage! 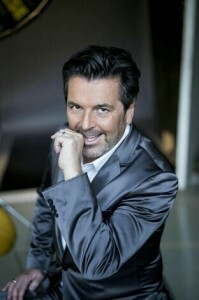 Thomas Anders was born March, 1st, 1963 in Münstermalfeld with his real name Bernd Weidung. Already as a child he loved music and performed locally on stage. More than 30 years ago he had his first TV appearance in a show by Michael Schanze. Since then he has been working on his career consequently and with an amazing self-discipline. Together with Modern Talking Thomas Anders has been to nearly every country in the world. Their first no.1 hit song „ you`re …“ rocketed to the top of the charts in 81 countries. A vast number of golden and platinic records as well as many other music awards were following. Especially with his numerous solo albums, which are released in Germany as well as in other countries Thomas Anders showed his versatile and brilliant voice. On his album “Songs forever” you can find a wonderful mix of well-known and popular songs from the 80-tees composed in a new sound. All songs are arranged in a sophisticated way and are vocally outstanding. The last solo-album “Strong” was sold more than one million times in Russia alone. In 2011 Thomas Anders released the album „Two“ together with the famous music producer Uwe … who had also produced songs for Nena. This album entered the charts straight away at no 11. Today Thomas Anders has more than 40 years experience on stage. His concerts together with the Modern Talking Band are still thrilling for thousands of people worldwide and his name is well known in the entertainment business. No matter what kind of show – TV, gala, exhibition or festival – people are fond of booking Thomas Anders. Thomas always keeps in contact to his fans. His fandom can be found around the whole world. He regularly informs his fan about all latest news as well as the current events via social networks and his newsletter. Once a years he invites his fans to the “International Fanday“ to Koblenz. There everybody can really get close to the action. This year the 25th anniversary of the fanday is celebrated. In spite of his great success Thomas Anders is still a very kind person and very much down to earth. Together with his family he lives in Koblenz and takes advantage of his prominence working for charity. Since 2008 he has been patron of the child protection association in Koblenz.